One of the first things to decide on for my new book is, of course, what it will look like. Shape, size, form, and all that other stuff that will determine how I make the rest of it. I knew from the beginning I didn't want to do a straightforward book, and finally decided on a maze book to get that sort of crazy meandering feeling from the shape, they display really well, and can be put on show and written on in different directions. 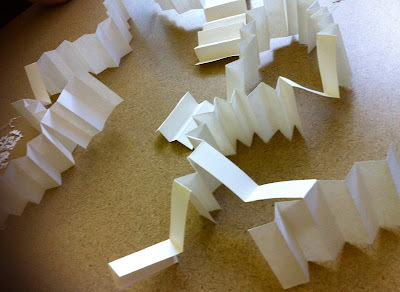 If you're not familiar with maze books there's a good tutorial here from Diana Trout's blog. The basic idea is to fold up a piece of paper, cut along some of the fold lines, and then fold it back up so the paper follows a long line. 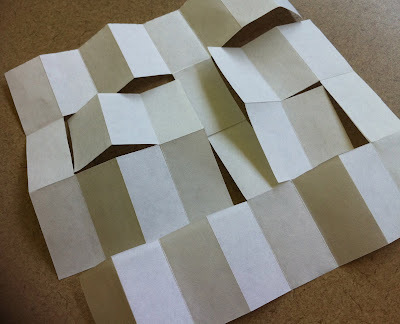 Check out the tutorial for a better explanation and because it shows a few different patterns. These are some experiments I did to figure out the shape I wanted, since where the cuts are changes the shape of the book. The people at the library definitely thought I was a crazy person with all of these little attempts strewn across the table. This is the pattern I finally decided on, with just a few things jutting off the main book. If you're thinking at this point that this is ridiculously complicated, this is about where that clicked for me as well. I certainly don't mind complicated, and I kind of like the shape this folded into, but I have to remind myself constantly that I'm trying to make a printed edition, not a single handmade book. I keep thinking to myself that it would be so much easier, and have much better results, if I did a single book, but I'm trying to stick to the original plan. Perhaps I should do a full template version? It might even be better in the end, because the idea is to make a less expensive book and it will certainly take less time to handwrite, compared to how long it will take to carve all the words... No! I need to concentrate on the first idea. It's about time I started pushing myself when it comes to what I make, and if it turns out the time it ridiculous, I'll just publish a larger edition number to bring the price down. I'm going to use this pattern instead. 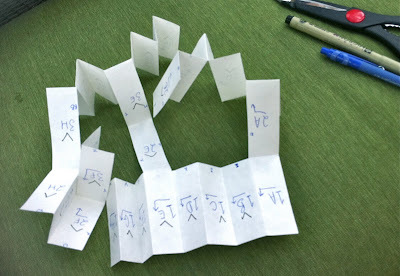 It's simpler to make, simpler to figure out how it folds together from the paper, and displays better. Great choice for a whimsical book, and with an edition you shouldn't get bored as they are so fun to make! I love that choice of shape. It will be beautiful!